Cats Naturally offers a compilation of the many healing values of nature. Cat lovers everywhere will be intrigued by the variety of natural foods, in addition to meat, which are acceptable to cats, ranging from sweetcorn to berries. The author gives diet charts to maintain good health and lists plants that cats instinctively use to keep themselves well. Proved herbal treatments for feline ailments are included. Affectionate, clever, amusing and resourceful though they are, some cats do have behavior problems, and these are dealt with here. 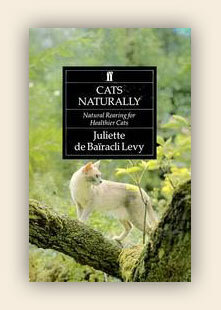 Juliette de Bairacli Levy is a world-wide authority on the natural rearing of animals and a pioneer in the field of their treatment by herbal medicine. She has proved over many years that her treatments and diets for animals are safe and effective and she is a renowned breeder of Turkuman Afghan hounds. She has cared for and loved cats all through her long and much-travelled life. As well as being a botanist and practical herbalist, she is also a soil doctor and anthologist of gypsy lore. Born in Manchester, of Turkish parentage, Juliette de Bairacli Levy is in her ninth decade of sharing her wisdom. Delightfully written by a remarkable woman. Juliette puts us in touch with cats' "inherited intelligence" and the healing that nature provides. For more information about Juliette de Bairacli Levy, click here.